Illegal acts in the financial industry are a major problem. Whistleblowers can help expose illegal corporate activity by filing complaints with a number of government offices that investigate fraud. Whistleblowers who report potentially illegal financial industry activities to the government may be eligible to receive a percentage of any award, and they are legally protected if their employer takes retaliatory actions. In fiscal year 2017, one whistleblower was awarded over $20 million. Whistleblowers can report financial fraud under the federal Sarbanes-Oxley Act and the Dodd-Frank Act. The Consumer Financial Protection Act (CFPA), which applies specifically to the consumer finance industry, is part of Dodd-Frank. If a whistleblower faces retaliation, he or she can file for protection with OSHA, the Occupational Safety and Health Administration. A New York employment lawyer can protect your rights. Two major laws at the federal level protect whistleblowers who speak out against potentially illegal activity by corporations. Sarbanes-Oxley, passed in 2002, and Dodd-Frank, passed in 2010, both contain provisions making it illegal for companies to retaliate against whistleblowers. Whistleblowers may also be eligible to receive rewards if a government investigation finds that fraud has occured. These rewards can be up to 30 percent of the government’s total recovery. Financial industry whistleblowing means coming forward to report potentially illegal actions, including violations of laws regulating consumer finance, corporate and accounting fraud, and security, commodity and currency exchanges. Whistleblowers can report financial industry violations to the Securities and Exchange Commission (SEC), the Commodity Futures Trading Commission (CFTC), or the Consumer Financial Protection Bureau (CFPB). Whistleblowers do not have to be employees. They can also be outside analysts, accountants, attorneys, or others with knowledge of the violation. The SEC runs a federal whistleblower program to provide monetary incentives for individuals who report possible violations of federal securities and commodities law. Whistleblowers can report possible corporate fraud to the SEC and CFTC, which will investigate. SEC and CFTC whistleblowers can file a complaint anonymously, but must be represented by an attorney to do so. A corporation markets a “high-yield investment program” to potential investors, but the payout comes directly from other investors. This is an illegal Ponzi or pyramid scheme. An employee at a securities firm becomes aware through internal documents that the company has illegally manipulated the price of a security and files an anonymous complaint with the SEC. A lawyer for a financial corporation learns that some employees are illegally “tipping” insider trading information for a fee. A financial company files false or misleading statements about the company in SEC reports or in financial statements, and an outside accountant provides this information to the SEC. In addition to whistleblowing related to securities and commodities, Dodd-Frank protects whistleblowers who report information about wrongful acts by companies that provide consumer finance services such as loans, property appraisals, financial advisory services, credit counseling, and credit bureaus. This category of whistleblowing often targets deceptive corporate actions that harm consumers, such as illegal debt collection, deceptive consumer finance advertising, or misleading materials that violate the Consumer Financial Protection Act. Whistleblowers can receive a percentage of the government’s recovery and are protected from retaliation, whether they reported internally to their employer or to the Consumer Financial Protection Bureau (CFPB). A bank that offers loans to its customers knowingly acts to deceive those customers into repaying loans that they were not legally obligated to pay. A corporation that offers mortgages uses deceptive advertising practices, such as claiming that consumers cannot lose their homes or making other claims to attract customers that are legally deceptive. Federal rules state that it is illegal for employers to impede individuals from whistleblowing. Confidentiality agreements cannot be enforced to stop employees from blowing the whistle on securities law violations, for example. A financial services corporation requires departing employees to sign an agreement prohibiting them from disclosing any confidential information, even information that violates securities laws. A securities company requires departing employees to sign a severance agreement in which they waive their rights to any monetary recovery if they file a complaint with the SEC. A publicly-traded company regularly discourages former employees from participating in any government investigations, including disclosing information that could be harmful or embarrassing to the company. If you act as a whistleblower and report corporate fraud, you have legal protections. However, for those reporting securities fraud, you are only protected from retaliation under Dodd-Frank if you report the fraud to the SEC. You are not covered if you only made an internal report to your employer. 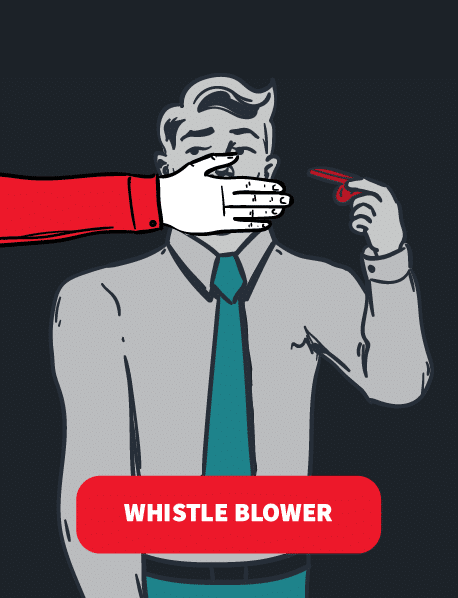 Employers sometimes take retaliatory actions against whistleblowers. The law provides protections and relief from these retaliatory actions. Retaliatory actions by your employer can include firing, demoting, suspending, threatening, harassing, or discriminating against an employee who has filed an action or participated in a fraud investigation. Many employees are covered by whistleblower protection laws. All employees of publicly traded companies are protected against retaliation. The employees of affiliates and subsidiaries of public companies, including the foreign subsidiaries and affiliates of American companies, are also covered. You do not have to be a direct employee of the public company or its affiliate to be protected. The employees of the company’s contractors, subcontractors, and agents also fall under both Sarbanes-Oxley and Dodd-Frank. If you are the victim of retaliation, you can receive reinstatement, double the amount of back pay owed, interest on the back pay, and compensation for any damages. This includes litigation costs and reasonable attorneys’ fees. At the federal level, OSHA’s Whistleblower Protection Program enforces whistleblower protections. If you acted as a whistleblower and your employer retaliated against you, OSHA’s Whistleblower Protection Program can help. Whistleblowers can report financial industry fraud to a number of government agencies, depending on the type of fraud, including the SEC, CFTC, and the CFPB. Many of the laws covering whistleblowers require them to take specific actions when reporting potential illegal activities. In order to gain the protection of whistleblower laws, employees should make sure to comply with the law’s requirements. The Dodd-Frank Act provides incentives for whistleblowers to report suspected violations of the law. Under Dodd-Frank, whistleblowers who report violations of securities laws, commodities laws, or the Foreign Corrupt Practices Act to the federal government can receive between 10 and 30 percent of the government recovery if it is in excess of $1 million. A New York employment lawyer can help protect your rights and recover money.